The Namibia flag features three diagonal bands in the colors of blue, red, and green. 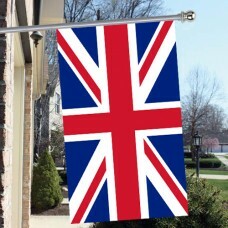 The red band is bordered by a thin white stripe. 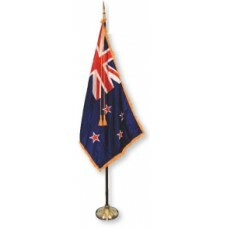 In the left hand corner of the flag, in the blue band, there is a 12-pointed gold star. The red color represents the people of Namibia, who are considered to be the country’s most important resource due to their struggle and determination to build a future for the country. The white color represents the peace and union, the green color represents the greenery and agriculture. The blue color represents the sky and the Atlantic Ocean, and the star is symbolic of life and energy. The Namibia flag was chosen as a result of a competition that was held by Hannes Smith, who also won the competition. 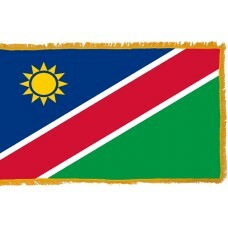 When the flag was designed, his interpretation of the colors was different, and the red color was supposed to represent the bloodshed in the Namibia war of independence, the green color represented the agriculture, the blue color for the Atlantic Ocean, and the sun represented the hope for good governance. The Namibia flag was adopted on March 21st, 1990 after they gained independence from South Africa. The colors of the flag were copied from the SWAPO flag. SWAPO (South West Africa People's Organization) was the organization that eventually managed to liberate the country and their flag was adopted in 1971. Namibia (formerly known as South West Africa) is a country in Africa that shares borders with Zambia, Angola, Botswana, South Africa, and the Atlantic Ocean. The capital and largest city of Namibia is called Windhoek. It is a country that has struggled and fought to gain their independence throughout the years and is considered one of the youngest countries, as it only received it in 1990. In 1884, Namibia became a German Colony, under the rule of Otto Von Bismarck and it became known as German South West Africa. In 1904-1907, Herero and Namaqua (both ethnic groups of South West Africa) revolted against the Germans and their control but were defeated by the German occupiers in what is known as the "First Genocide of the twentieth century." The Germans culled 10,000 of the Nama and 65,000 Herero, which was approximately 80% of the population. During WWI, however, the Germans were defeated when the South African army occupied the territory. As a result of this, South West Africa came under the rule of South Africa. In the early 1960s, SWAPO began to try and establish independence of the country. On June 12th, 1968, South West Africa’s name was changed to Namibia and in 1990, independence was finally gained. Namibia's name is derived from the Namib Desert (the oldest desert in the world) and translates as the "area where there is nothing." It is the second least populated country in the world, yet it attracts over a million tourists each year and the economy is very reliant on this. The main tourist attractions include the Etosha National Park, which is considered to be Namibia's top wildlife destination and is home to Africa's tallest elephants and the Sossusvlei, located in the Namib Desert which is a salt and clay pan that is surrounded by excessively high red sand dunes.